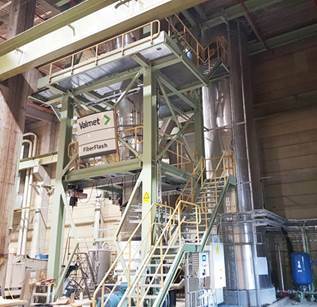 The first ever flash dryer for purely fiber delivered under the Valmet brand has been started up with fiber at Stora Enso's biocomposite plant at Hylte Mill in Sweden. The project was completed according to schedule and all guarantees fulfilled. Stora Enso decided to invest in full-scale production after seeing strong customer demand for higher volumes of pulp pellets production, to be used as a renewable replacement for plastics. 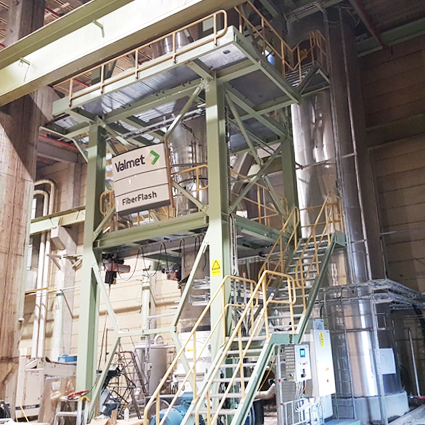 Valmet's scope included a complete flash dryer with drying stage, scrubber system, supporting and platform, construction, insulation, spare parts, basic engineering, mechanical and electrical erection, erection advising, checkout and start-up supervision and training. The dryer will dry from 43% to 93% dryness. "The design of the dryer system has been adapted to fit the new equipment into the existing plant and with other machinery in the production line. Adaptations are challenging but we are used to being flexible in rebuild projects even if the delivery times are short sometimes. We have utilized the knowhow we have from flash drying in the panelboard industry," says Marika Levander, Senior Project Manager at Valmet. Flash drying can be described as almost instantaneous evaporation. Small particles and single fibers with a large exposed surface area meet the hot air stream in the drying stages. Fibers carried by the hot air through the system stay in the drying zone for less than 30 seconds and are never heated higher than the wet bulb temperature. Exhaust gases from the cyclones are cleaned in a gas washing scrubber tower, which minimizes particle emissions into the atmosphere. The system represents a considerably lower investment cost than a conventional sheet dryer. Valmet FiberFlash in Hylte Mill. Part of the bioeconomy, Stora Enso is a leading provider of renewable solutions in packaging, biomaterials, wooden constructions and paper globally. Stora Enso has some 26,000 employees in over 30 countries. Sales in 2017 were EUR 10 billion.